Mainz - Shinji Okazaki arrived late for his arranged interview with bundesliga.com, but there was a good and honest reason for his tardiness. The 28-year-old was running late because he had forgotten a crucial piece of equipment and had to go home to get it: the television remote control. After returning with the prized possession, he was able to tune his 1. FSV Mainz 05 team-mates into the final of the AFC Asian Cup. In the flesh, Okazaki comes across exactly as he has been portrayed in Mainz: his feet firmly on the ground, humble and willing to help. Oh, and also successful. While his colleagues eagerly followed Joo-Ho Park on his way to victory with South Korea in the Asian Cup, the Bundesliga's leading marksman shared his thoughts with bundesliga.com on records, how he deals with all the hype back home and why he has founded his own football club in Mainz. bundesliga.com: Shinji Okazaki, Sunday's game against Borussia Mönchengladbach is something of a top-of-the-table clash. What do you make of your side's first six games of the season? Shinji Okazaki: We mustn't forget that we started the season by getting knocked out of the UEFA Europa League and the DFB Cup. We got a fair amount of stick for those defeats, which made us go that extra mile in training. That hard work has contributed to the start we've made, and of course the fact we signed another five new players before the transfer deadline. I think these are the reasons why we're still unbeaten. bundesliga.com: Things are going excellently for you personally. With five goals in the league and a grand total of 30, you've dislodged Yasuhiko Okudera as the most prolific Japanese player in Bundesliga history. Was that one of your objectives [for this season]? Okazaki: No, not at all. bundesliga.com: So what were your objectives? Okazaki: Of course it's a nice record to break, but I feel an even greater responsibility this season compared to last because Nicolai Müller and Eric Maxim Choupo-Moting, who scored many goals for us last term, are no longer here. I'm no longer a newcomer and I'm the most prolific player in the team now. I think that we were knocked out of the Europa League and DFB Cup because I didn't take the big chances I had. The outcome of our games often depends on whether I score the goals or not, and because I have that in my mind, I'm even more focused when the chances come my way and that is why I've been able to score five in five games. Okazaki: I wasn't in the squad against Hoffenheim, but I was watching on from the stands and I could see that our form is improving. That's been noticeable for a while and this is one of the reasons why the final balls have been reaching me on a more regular basis. My good scoring record is also down to excellent team work. bundesliga.com: You are also a hard-working defender. How do you manage to keep your concentration levels so high when you also have such a high work rate? Okazaki: I'm now used to the way Mainz play and how football is played in the Bundesliga, and I know how to save energy in defence and during build-up play. That allows me to focus all of my energy and concentration on sniffing out chances. bundesliga.com: Mainz's general manager Christian Heidel once said that you were always distraught when you didn't score. Is that still the case? Okazaki: Yes, it's true. It's always been like that, even when I was playing in Japan. But at least I'm able to put this disappointment behind me quickly and move on. I'm always a bit sad after games in which I don't score a goal. bundesliga.com: Has your role in the team changed under the new coach Kasper Hjulmand compared to how it was under Thomas Tuchel? Okazaki: Not much has changed, but Mr Hjulmand is a different kind of person to Mr Tuchel. Thomas Tuchel was a stricter coach who could also raise his voice and keep the tension levels high within the team. Mr Hjulmand is more of a relaxed guy. He always thinks positively and tries to encourage us. bundesliga.com: How does that work in practice? Okazaki: Even after we had lost in the cup, he would raise our spirits. He told us that we had to pick ourselves up quickly. With him, every single one of us is encouraged to take the initiative. Possession has also become more important. To begin with, we had to adapt a lot, but now we've understood what he wants and that makes us even more motivated. Personally I think that I can become even more mature as a player this way. bundesliga.com: Mainz are planning a trip to your home country at the end of this season in order to attract more sponsors. Are you already actively involved in this project? Okazaki: Not really, but the club did recently open a Japanese Facebook page and I'm delighted that Mainz are making an effort to forge strong relations with my home country. Of course that's something I want to put all of my energy into supporting. bundesliga.com: You founded the local amateur team FC Basara Mainz. Why? Okazaki: I've been living in Germany for three and a half years now and I would like to keep some links with Germany when I end my playing career. It was important for me to support young Japanese players who want to play football here. That's why, together with a former school friend of mine, we decided to found this club, who are playing in one of the amateur leagues this season. Not only Japanese players play for us, though – we also have Germans and players from other countries. bundesliga.com: Does that mean you're keen to extend your contract with Mainz? 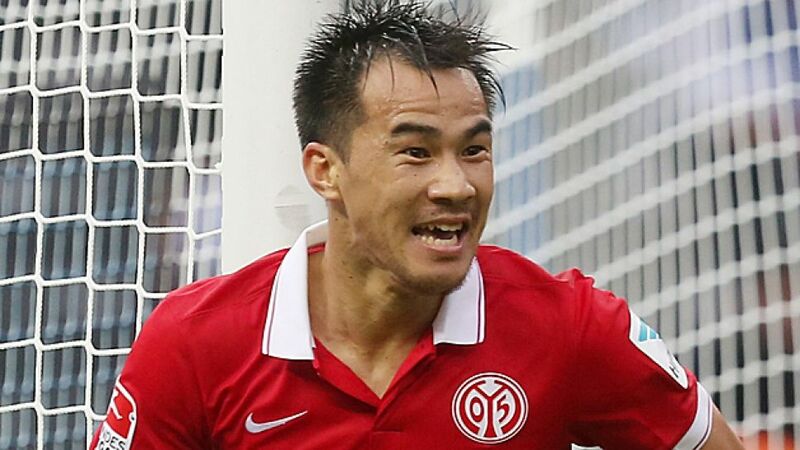 Okazaki: Founding Basara Mainz has nothing to do with my contract, which runs until 2016 anyway. I like this city a lot and I want to leave a legacy here. bundesliga.com: Heidel says you are a hero back home in Japan. How do you deal with that? Okazaki: I wouldn't say I'm a superstar at all. Of course I'm frequently stopped on the street in Japan, but I just try to be relaxed about the situation. I try to be myself and sign autographs or pose for photos. Maybe I behave like this because I don't see myself as a star. bundesliga.com: There are many Japanese reporters following your progress here in Germany. Do you read the articles that are written about you in Japan? Okazaki: Yes (smiles), most of them. bundesliga.com: And what do you do when you're not playing football? Okazaki: The thing I like the most about life in Germany is that I have a lot of time for my family. In Japan, you don't get that much time outside of work; the clock ticks faster there. In Germany, I have a lot of down time and I often play with my children or see how things are going with Basara Mainz, or just go to the café with my friends. The clock ticks slower here and I enjoy it.